3 Triggers Of Fall Allergies - Seasonal Allergies. You may love winter because of the crispness in the air and snow-cover trees, or you may just love the fact that you get some much-needed relief from seasonal allergies. Though you appreciate the beauty of spring flowers, the emergence of warmer weather also brings on sneezing and congestion. Your misery continues all trough fall. If your suffering is severe, you may find it hard to believe that some people'may be unaware of the symptoms of seasonal allergies.' On the other hand, although you are well aware of the symptoms you suffer, you may not know that you can often avoid'common allergy triggers. Practicing a few simple strategies can minimize your misery until the first snow falls. Exposure to pollen can trigger symptoms that look much like the flu: sneezing, watery eyes, headaches and nasal congestion. You can treat allergic symptoms triggered by pollen with prescription and over-the-counter medications. In extreme cases, you physician may recommend desensitization therapy. However, you can lessen your suffering by avoiding exposure to pollen. Do not grow flowering plants indoors. Avoid being outdoors during windy weather. If you must venture out of the house, wear a protective mask whenever you are anywhere other than your home, your car or another indoor facility. Use air conditioning indoors to prevent pollen from reaching the indoors through open windows and doors. Mold spores grow in damp, dark environments both indoors and outdoors. Basements and bathrooms are breeding grounds for mold. Mold is also found in bales of hay, under mushrooms or mulch. Allergic reactions to mold are much like those of pollen. Dust mites are actually microscopic organisms that breed within dust particles. Dust mites are found in mattresses, pillows, upholstery or virtually any soft surface. Unlike pollen, and to a lesser extent, mold, and dust mites trigger allergy symptoms year round. Protect yourself from dust mites by investing in mattress, box spring and pillow enclosures. Wash your sheets with hot water each week to disinfect them of any dust mites that might have gathered on them. Do not keep stuffed animals and throw pillows on your bed to minimize the presence of dust mites where you sleep. Invest in a dehumidifier with a HEPA filter to rid the internal air of dust mites. 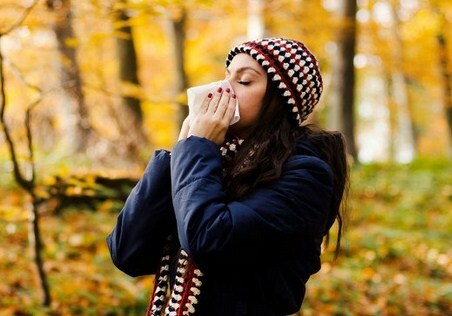 Besides taking over-the-counter and prescription medication, minimizing your exposure to seasonal allergy triggers is your best strategy for reducing your seasonal allergy symptoms.' Keep your internal environment clean and the indoor air in your home clear to minimize symptoms. While you may not completely eliminate allergy attacks, you can lessen their frequency and severity, along with reducing the need to take anti-allergy medication to address your symptoms. Adam Jenson is an allergist. He loves to inform consumers about the allergy risks by writing on health and wellness blogs.